"C.R. Rao is not only a highly creative theoretician, but was attracted and labored with many data sets in health, biology, psychology, and social sciences." Member, National Academy of Sciences, USA. C.R. Rao was born on 10 September, 1920 in Huvanna Hadagali, now in Karnataka State. He studied in schools at Gudur, Nuzvid, Nandigama and Visakhapatnam, in Andhra Pradesh and completed his M.A. degree in mathematics at the Andhra University in Waltair, Andhra Pradesh. He did his M.A. degree in statistics from Calcutta University in Kolkata, West Bengal. C.R. Rao worked in India at the Indian Statistical Institute for 40 years before he took mandatory retirement at the age of 60. He moved to USA and worked for another 25 years at the University of Pittsburgh and the Pennsylvania State University. In reply to a query put to him as to what particular achievement he is most proud of, C.R. Rao replied, “it is the outstanding contributions my students are making to statistical theory and practice.” He is still active at the age of 87 as the Director of the Center for Multivariate Analysis at Pennsylvania State University. Rao received MA degree in mathematics with a first class and first rank from Andhra University (1941) and MA degree in statistics from Calcutta University (1943) with a first class, first rank and a record of marks unbeaten till now, and a gold medal. He started working in the ISI at Calcutta as a research scholar in1943. He was invited to work on a project at the Museum of Anthropology and Archeology at Cambridge University, UK, which required the statistical methodology developed by P.C. Mahalanobis,the founder of ISI. Based on the work he did, he earned his Ph.D. in 1948 from Cambridge University with R.A. Fisher, the father of modern statistics, as his thesis advisor. A few years later, in 1965, the university awarded him the prestigious Sc.D. degree based on a peer review of his research contributions to statistics. Honorary Doctoral Degrees: Up to date, he received 31 Honorary Doctoral Degrees from universities in 18 countries spanning six continents. He held such prestigious positions, as the Director of the ISI, Jawaharlal Nehru Professor, and National Professor, all in India, University Professor at the University of Pittsburgh and Eberly Professor of Statistics and Director of the Center for Multivariate Analysis at Pennsylvania State University in USA. As Head and later Director of the Research and Training School at the ISI for a period of over 40 years, Rao developed research and training programs and produced outstanding students which “put India not far from the center of the statistical map of the world”, and earned for ISI the name of Indian School of Statistics. During this period he also directed the training programs at the International Statistical Educational Center which led to the development of statistics in the South East Asian region. Rao was the Chairman of a UN Committee, which examined the demand for statistical personnel in Asian countries and recommended the establishment of an Institute for statistical development in South East Asia. On the basis of his recommendation The Asian Statistical Institute now known as Statistical Institute for Asia and Pacific was established in Tokyo to provide training to statisticians working in government and industrial organizations. C.R. Rao played an important role, under the direction the doyen of Indian statistics, P.C. Mahalanobis, in setting up state statistical bureaus in different states of India and developing a network of statistical agencies at the district level for collection of data. Together with the Central Statistical Organization and the National Sample Survey in planning of which, C.R. Rao played a significant role, India has one of the best national statistical systems. He founded the Indian Econometric Society, which has been active in promoting quantitative studies in economics for planning purposes. C.R. Rao was the founder of Indian Econometric Society and Indian Society for Medical Statistics which hold conferences every year to discuss problems of current interest. C.R. 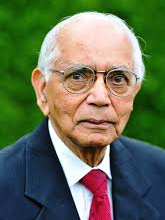 Rao accepted University Professorship at the University of Pittsburgh after he took mandatory retirement from the ISI in India at the age of 60. He worked for eight years at the University of Pittsburgh and moved to the Pennsylvania State University as Eberly Professor of Statistics, where he continues to work as the Director of the Center for Multivariate Analysis (CMA). The CMA, established at his initiative serves as a meeting place for research workers in multivariate analysis from all over the world. He directed the research work of several students for the Ph.D. degree in USA. He edits a series of Handbooks on Statistics (27 volumes up to date) in various fields of applications for the benefit of researchers and consultants, and continues to be active in research at the age of 87. C. Radhakrishna Rao is among the world leaders in statistical science over the last six decades. His research, scholarship, and professional services have had a profound influence on theory and applications of statistics. metric and distance, Analysis of Dispersion (MANOVA) and Canonical Variate analysis and G-inverse of matrices appear in all standard books on statistics. Cramer-Rao Bound and Rao-Blackwellization are the most frequently quoted key words in statistical and engineering literature. Special uses of Cramer-Rao Bound under the technical term, Quantum Cramer- Rao Bound have appeared in Quantum Physics. Rao-Blackwellization has found applications in adaptive sampling, particle filtering in high-dimensional state spaces, dynamic Bayesian networks etc. These results have led to contributions of strategic significance to signal detection, tracking of non-friendly planes and recognition of objects by shape. Other technical terms bearing his name appearing in specialized books are Rao’s F and U tests in multivariate analysis, Rao’s Quadratic Entropy, Cross Entropy and Rao-Rubin, Lau-Rao, Lau-Rao-Shanbhag and Kagan-Linnik-Rao theorems on characterization of probability distributions. Two of his papers, one on estimation leading to many technical terms and key words and another on score test which had a high impact on the development of statistical theory appear in the book Breakthroughs in Statistics: 1889-1990. Rao has made some significant contributions to combinatorial mathematics for use in design of experiments, the most important of which is Orthogonal arrays (OA).The basic paper on the subject appeared in Proc. Edinburgh Math. Soc. (the referee of the paper reported that it is a fresh and original piece of work). The Japanese Quality Control Expert, G.Taguchi made extensive use of OA’s (described by Forbes Magazine as “new mantra” for industries), in industrial experimentation. Rao defined a generalized inverse (g-inverse) of a matrix (singular or rectangular) and demonstrated its usefulness in the study of linear models and singular multivariate normal distributions. He is the author of 14 books and about 350 research papers. Three of his books have been translated into several European and Chinese and Japanese languages. C.R. Rao is the eighth child in a family of six brothers and four sisters who were raised by his parents, C.D. Naidu and Lakshmikantamma, and was named Radhakrishna following the tradition of naming the eighth child in a family after God Krishna, who is the eighth child. He married Bhargavi who has two master’s degrees, one from Banaras Hindu University in History and another from the University of Illinois, USA, in Psychology, and a Bachelor’s degree in Teacher’s Training. She worked as a professor of psychology at Jadavpur University, Kolkata for a number of years. They have a daughter, Tejaswini who holds a Ph.D. in Nutrition from the Pennsylvania State University and works as a Professor in the Dietetics and Nutrition department at the SUNY College, Buffalo. She is an accomplished dancer of the Bharatanatyam and Kuchipudi classical dance styles and is the director of a dance school called Natya. They have a son, Veerendra who is an electrical engineer and computer scientist. He has a computer consultancy in Pittsburgh. He has two sons, Amar, who is in his final year of high school, and Rohith, who is currently in middle school. To disseminate advances made in the Disciplines of Mathematics, Statistics and Computer ScienceTo conduct, Promote, Carry out research and advanced study in Mathematics, Statistics and Computer Science.